I have a guilty pleasure. I enjoy the occasional McDonald's cheeseburger. I have no qualms admitting it. Sometimes I just have a craving that needs to be satisfied. And McDonald's fits the bill. Now, I've never worked at McDonald's, but I've heard stories. With over 33,000 locations worldwide, McDonald's needs a system to ensure they deliver standard products across their franchises at a fast food pace. If you want to learn standard work, a McDonald's restaurant is a good place to start. The video below illustrates McDonald's "Made for You" kitchen system. I remember as a teenager the trick of ordering a sandwich with no pickles, just so you could ensure that it would be made fresh. By forcing the kitchen to make a special order, you would bypass the warming oven lined up with Big Macs ready to go. In the "Made for You" kitchen, there are no more warming trays. Each sandwich is prepared when the order is received from the customer. 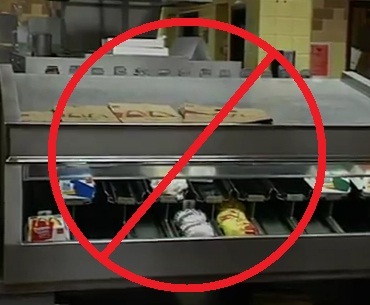 Yes, McDonald's sandwiches are lean! This lean kitchen production system targets under 90 seconds from order to delivery and that includes 11 seconds of waiting for the super fast toaster! Of course, you might wonder how meat can be grilled in under 90 seconds. And you would be right to be a little suspicious, since they have diverted the inventory from Finished Goods to WIP. Instead of holding finished sandwiches under a heat lamp, they prepare the meat only a little bit in advance. The meat is kept in special "universal holding cabinets" that have been engineered to ensure the meat is kept at the correct temperature with minimal moisture lost. With customers demanding a larger menu with more variety, McDonald's has met the challenge with the it's "Made for You" kitchen﻿ system. Sure, it's still fast food. But speed is a major one of their customers' requirements. I'm not here to judge whether you should or shouldn't eat at McDonald's. It's still a free country. Eat where you like. But if you're wondering how McDonald's can deliver a hot Quarter Pounder with cheese into your hand with no onions and extra ketchup in under 60 seconds, you have to watch this video! Unfortunately, this video is no longer available.. But I found another video, just like it.. I think it's the same one. Here's a different video about the McDonalds "Made For You" implementation. Not quite the same thing, but there's a few additional tips here on change implementation in a large business. I've added this video to my monster list of free lean videos. Thanks for letting me know. I think I found it again, or at least a different version. I've update the post above. I worked at McDonalds in high school in the 70's....the "made for you" was put into place to reduce cost and theft and is a failure in my eyes...Sandwiches are cold and dry and looked like they were put together by Helen Keller. I couldn't agree more. Example, a Big Mac today just looks like a bunch of various 'food discs' stacked into the little cardboard box. The components of the sandwiches don't adhere to each other as they did with the old production system. Now, you pick up a Big Mac and it just slides apart before you can finish half of it. No wonder the Arches are crumbling. Well, I think things have changed a little at McDonalds since the 70's, but it's still fast food!